A successful fun day today at Hawksveiw. 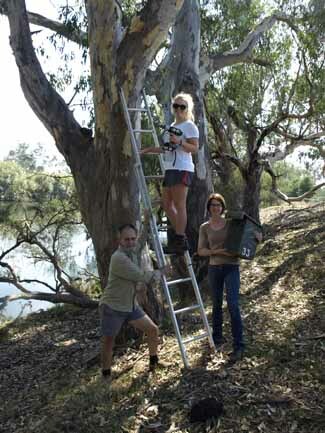 Ros and Pam Web hosted a short working bee putting up nestboxes on their property “Hawksveiw”. The aim was to increase the dens available to the gliders believed to be present in the environmental planting along the Murray River and Sandy Ck and to monitor their movements. 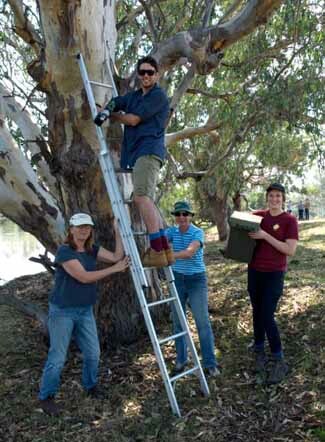 With the assistance of 3 keen CSU students (Lewi, Sarah and Philippa) and a couple of regular “Spillway Glider Friends” 10 boxes were installed and a picnic lunch was shared on the Riverbank. A big thanks from Ros and Pam to all the helpers and for Rowena and Kaye for preparing lunch.